When are suffering from water retention and have swollen feet, here are the only tips to keep edema from ruining your figure. Edema is caused by water retention in body between accumulating fluids beneath the skin producing swelling throughout your body. There are many types of edema known today, but what comes to mind the most is why you get swollen feet, pedal edema. Edema treatment to reduce ankle swelling and swollen legs in general comes in many shapes and forms including: ways you can prevent edema from making your legs swell up by changing your lifestyle; and watching what you eat and drink restoring chemical balance back to your body from the inside. Just by making simple alteration in how you live your life is it possible to treat edema preventing water retention in your legs eliminating swollen feet. Simply by taking a bath instead of a shower, refraining from wearing high heel shoes, and being active throughout the day can you prevent swollen legs and feet. How to I keep my legs from swelling up during the day? 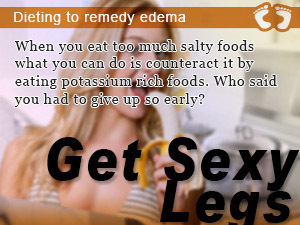 Besides what you can do to treat edema preventing leg swelling from ruining your day from the outside you diet presents a window of opportunity to ward off edema in your legs. All you have to do is watch what you eat and drink balancing water retention with salt consumption. In this episode of Slism, we will discuss ways you can apply simple edema treatment to reduce fluid retention treating swollen feet. If you suffer from swollen feet and find it hard to make time to take a bath, then bathing may be just what you need to fight off swollen feet and legs. Taking a bath may not seem like a form of edema treatment, but it works wonders in reducing the water retention causes by edema in your body and pedal edema in your legs. So if you suffer from leg swelling, remember to do take a long hot bathand give yourself a relaxing lymph massage for best results. What do you do if you don't have time to bathe? Even for people who think finding time to take a bath is impossible or others who life by themselves who feel they don't have to taking a bath is direly important. That is why even if you can't give your feet a bath while you are taking a shower to treat swollen feet. If you can't find time to take a shower watch your feet in the sink. Fill up the sink with hot water and soak your feet to promote better circulation in your legs while treating leg swelling caused by edema. You would be surprised how much a little soak makes a difference. Just when you thought wearing high heels was making you look sexier highlighting your body line as you walk, in fact what high heeled shoes are doing can possibly making your legs look fat causing your legs to swell up a noticeable sign of pedal edema. High heels are said to contribute to swollen feet making it easier for innocent water retention to develop into unsightly edema making your legs look as if they are fatter than they really are, not something a women wants walking bare-skin in a business suit. Putting on a pair of high heeled shoes only asks for fluid retention in your legs to increase causing your feet to swell. It may be time to change what you are at work, in-transit, or on the town if you hope to stand a chance again pedal edema. What have you got to lose? If you can't quit the habit of wearing shoes with heels, then what you might be interesting in getting is a pair of walking shoes that come with heels. It may be time to start treating your feet right for a change. It doesn't matter whether you are standing up or sitting down, if you are not moving your body you are prone to develop edema. Just because it is considered to be an occupational disease, does that mean you have to give up on your body? No not at all. There are tons of things you can do at work seamlessly to stop edema from ruining your legs. Just because you are at work doesn't mean you can't do your body some good doing light exercise throughout the day. Here's a little exercise you can do while working to get rid of edema ankles. Stretch you can do whether you are standing up or sitting down at work without anyone noticing. Heel planted on the floor slowly raise your toes towards the ceiling holding for 2 to 3 seconds. (From a sitting position you should be able to do both your ankles at the same time; however if you happen to be standing do each ankle separately using your other foot for balance. Return your feet back to the floor. Bring your feet back to the floor. When standing repeat on the opposite ankle. Doing this exercise helps relax your calves promoting better circulation in your legs effectively treating pedal edema. Although you may be thinking that opting out on drinking water is going to help with fluid retention, that doesn't mean it's going to help you get rid of swollen feet caused by edema. In that respect, not getting enough fluids in your body is not going to help at all. Rehydration above helping your stay alive helps flush out the toxins in your body. Without rehydrating your body you really limit your body's ability to detox. However, it is said that when someone with a bad metabolism drinks too much water this is what causes edema in the first place. That's why it recommended that you drink a suitable amount of what that's right for you. For people who exercise and resultantly sweat a lot and people who don't sweat no matter how much they move differ in the amount fluids needed to be restored to the body. The amount of water you need each day is not determinable. What's right for you may not be right for others. Note the following is only a guideline giving you a point of reference. Drink 2 liters of water a day. That's over half a gallon! I know you are thinking How am I supposed to do that? It turns out that you can get away with drinking less by taking into consideration the water content in the foods you eat throughout the day. On the other hand, just to stay safe you might want to consider making drinking 2 liters a day on of your goals to stay motivated. A good rule of thumb is that if you are thirsty that's a sure sign that having a glass of water isn't going to hurt your diet on bit. Be careful when drinking ice cold or chilled drink because there runs a risk of causing water retention turning into edema. If you can, drink water at room temperature for best results. Even if you think you aren't eating that much salty food, you would be surprised how easy it is to overdose on salt without thinking about it. foods that contain large amounts of salt. You may judge how much salt something contains by how salty it taste, but tasting is only going to get you so far. The fact is that tasting alone doesn't give you're a number you can chew on to tell you just how much salt you have in your diet leading to the development of edema. That's why it's dire that you check the salt content of the foods you eat before putting it in your mouth. What amount of salt is safe to eat? The Daily Intake Standards (2010) prescribed by the Ministry of Health, Labor and Welfare of Japan says you should stay below 10 grams for men and 8 grams of salt (Sodium Chloride) a day for women. Conversely the Ministry of Health says people should limit their daily salt intake to 1.5 grams and 2.3 grams a day. Note that this is one area where traditional western diets and East Asian diets like the diet of Japan (What foods Japanese people eat) differ. Be careful what you eat because not knowing about how much salt you eat a day doesn't some without consequences. Consider the case of going out to eat fast food because that's what you're craving for at the moment. You order a chicken fillet sandwich (only sandwich because you're not thirsty and think fountain drinks are bad for your diet) and wait for your turn to be called out by number. Number 45! (Note that this was early in the day because you like to get up early for a morning stretch everyday) The fast food employee calls you out by the temporary assignment you call your number. Shortly after getting hold of your food so you can final stop thinking of yourself as a number for food, you sit down and open what too your delight is the new crispy chicken filet being sold at McDonald's. After eating you go online and find this page and read, "There's 570mg of Sodium in 1 filet (96g)!" That over one-third the amount you should be getting every day. Never fear, if you can get through the rest of the day in 1g of Sodium then you have nothing to worry about. On the other hand, if you can't you need to get some potassium in your body! Potassium is said to help restore the electrolyte balance of your body expelling lowering the amount of salt stored in your body. There happen to be a number of foods that you can eat to directly put potassium into your body. Foods with high potassium content include avocadoes, spinach, or my favorite a good old yellow banana. Water retention diet for leg edema roundup to treat swollen feet before it’s too late. Don’t let swelling ankles and legs stop you from making an impression that lasts. Eating tips on food seasoning to reduce water retention in your legs and body that are so simply you would be crazy not to give a try to say goodbye to leg swelling. Stop cellulite early on with natural fluid retention treatments that gets rid of unwanted leg swelling. Cellulite removal with sitz bath natural treatment method. Fix leg swelling in only minutes a day with this leg massage. Quick steps to help you reduce swelling in your legs in the comfort of your home for free. When your legs are swollen feeling, simply walking becomes a pain. Some pain you can live without and leg swelling is one of them. Treat yourself. Fluid retention in your body is something you can live without. Making the right choices and eating healthy can help you keep the water out. When you eat too much salty foods what you can do is counteract it by eating potassium rich foods. Who said you had to give up so early?